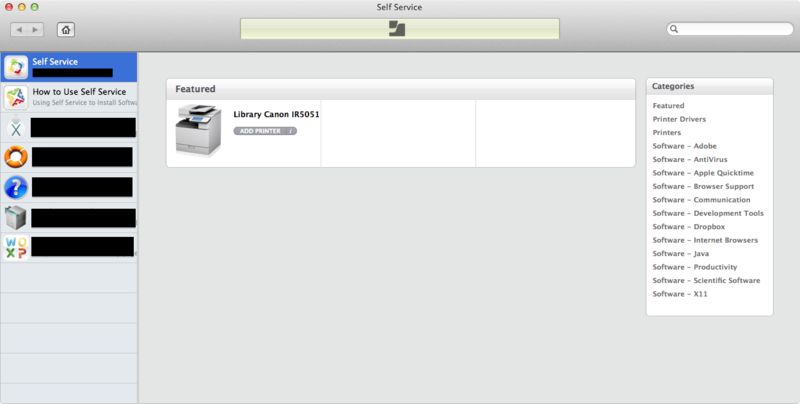 A. Casper will check the Mac to see if the needed Canon printers are installed. B. 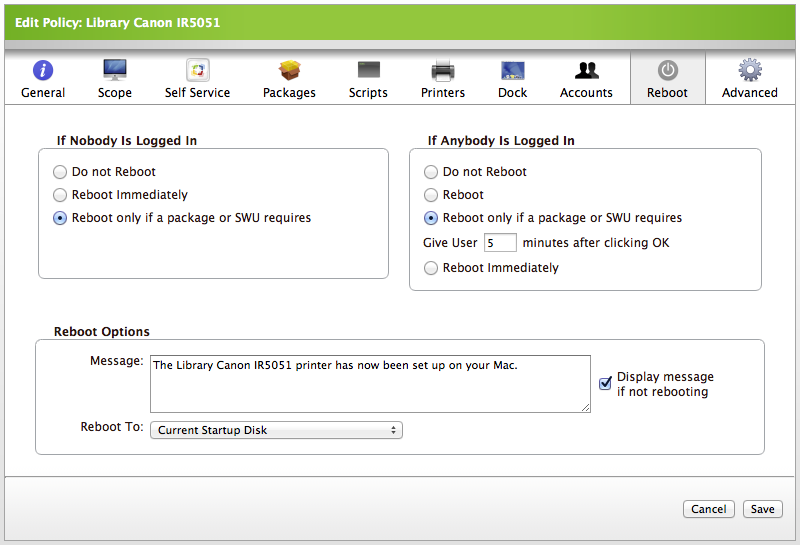 If no Canon drivers or older Canon drivers are detected, the appropriate Canon print drivers will be installed before the requested printer is set up. C. If the installed drivers are the same version or higher as the print drivers available via Self Service, no drivers are installed and Casper will proceed to set up the printer using the installed drivers. The first part was figuring out if the needed Canon drivers were installed. Canon’s installer package didn’t have an easy way I could see to discern the driver version from the installer receipts, so I looked for something else that would have the version number. 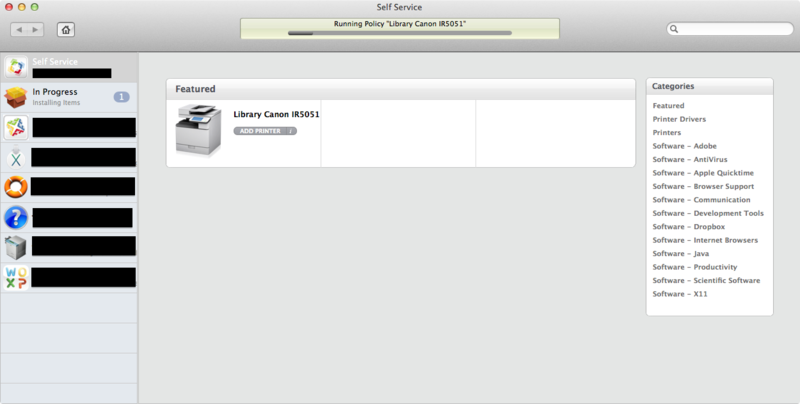 After some digging, I was able to confirm that the Canon CUPS PS Printer Utility application located in /Library/Printers/Canon/CUPSPS2/Utilities had the version number that I was looking for. I also confirmed that I could use the defaults command to pull the version information from the CFBundleVersion key value stored in /Library/Printers/Canon/CUPSPS2/Utilities/Canon CUPS PS Printer Utility.app/Contents/Info.plist. – If the value returned is less than the version of the current drivers, the print drivers are installed by a Casper policy before the requested printer is set up. 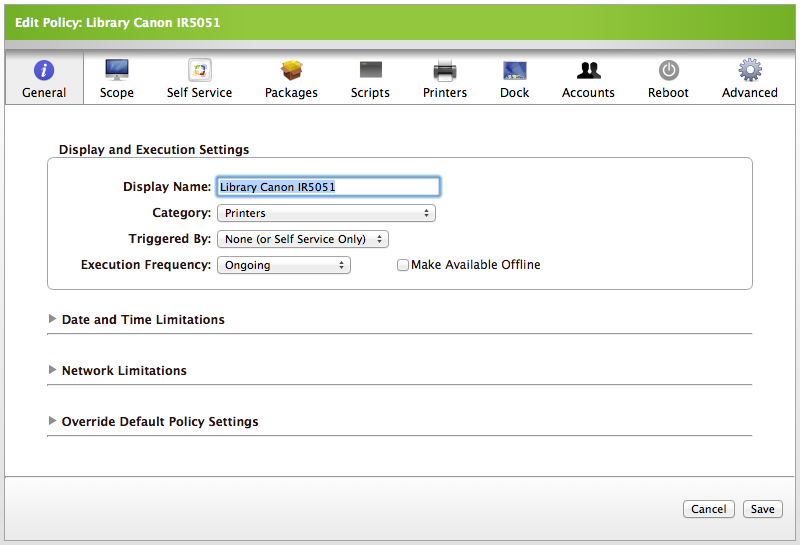 – If the installed drivers are the same version or higher as the print drivers available on the Casper server, this information is logged and the Canon print drivers are not installed. The driver version that the script is looking for is then set on the JSS by using Parameter 4 in the JSS settings for the script. As of 2-6-2014, the current version is 4.1.0. The script uses a manual trigger to run a Casper policy that would install the print drivers. The next part was to build a policy which used that trigger. Building the policy was straightforward, as I just needed it to respond to the manual trigger and install the package specified by the policy. When new Canon drivers come out, all I should need to do is update the policy with the new installer package. Once I had the script and policy in place, I updated my printer setup policy with the new printer settings and added the previously-mentioned script. When added, I set the script to Run Before and set 4.1.0 in the Parameter 4 blank. The result is how it appears at the user’s end. When the printer setup is selected, the script will run before the printer setup and do its version check. If new drivers are needed, a message will appear to inform the user that the drivers are being installed. 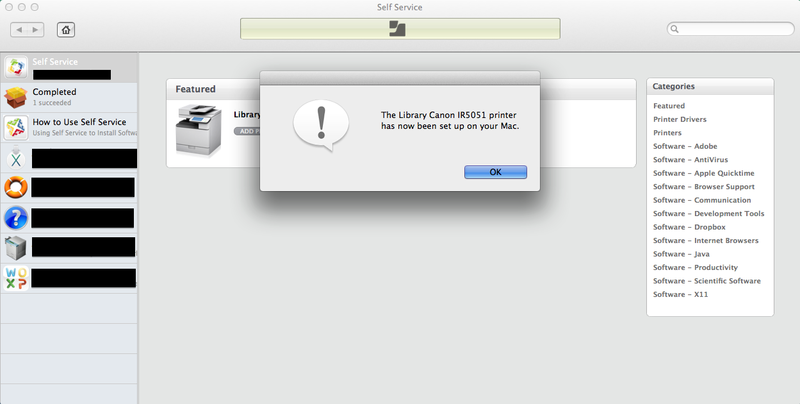 Once the printer setup has completed, a message will then appear to let the user know that the printer setup has completed. One issue that this process does not address is the problem of existing printer setups. 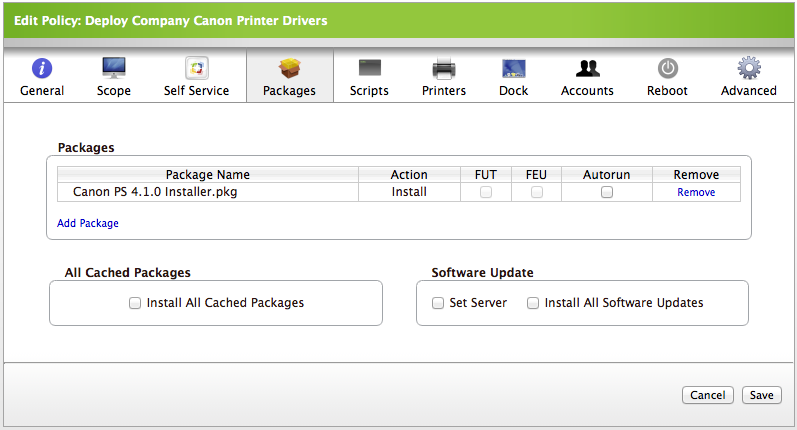 In the documentation for the new drivers, Canon noted that existing printers may need to be deleted and re-setup following the installation of the new drivers. Since the new drivers are now automatically installed on an as-needed basis by Self Service, existing printers may break. 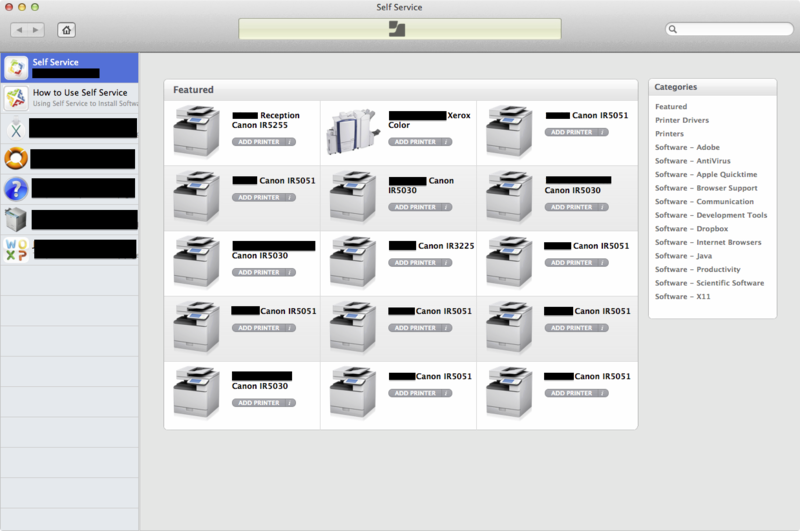 That said, if all relevant Canon printers are registered in Self Service, the fix should be to tell folks with this problem to delete the non-working printer and set up the printer again in Self Service. Thank you for sharing this – I’m actually hoping to do something similar with our set up here. Would prefer to have driver versions checked this way as opposed to installing the drivers over and over again for the reasons you stated. We’ve got mostly HP and Xeroxes here. Rich, thanks – that’s great! I’m looking forward to playing around with this and have already set up a reminder for myself to check it out tomorrow. Our printer driver policy setup have been nagging me for months – what we have is better than the methodology it replaced but it’s far from being as efficient or effective as I’d like. The treatment of the drivers that are already installed on the client was something that I was hoping to address with something like this. thanks for sharing this article. I purchased a canon printer 15 days ago. 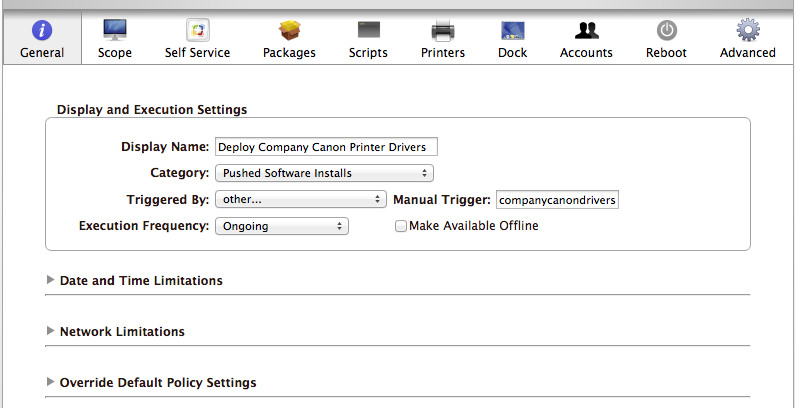 I install canon driver in my mac. but canon install’s package had not installed. 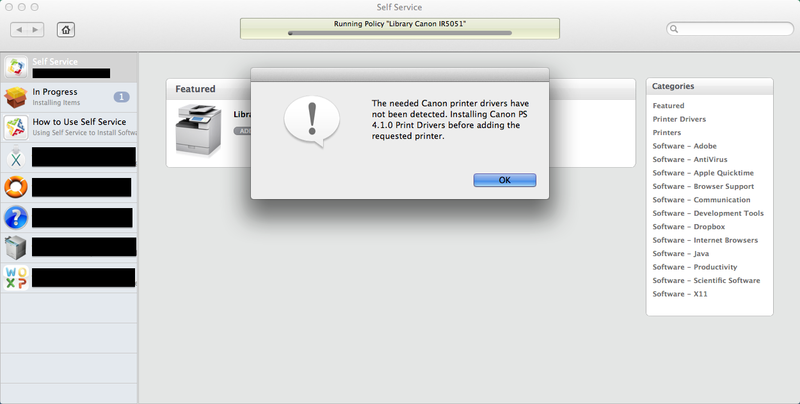 I search on the internet I read about canon printer support and they fix this problem.